From September 2017, we’ll be welcoming a new adult cast to the Cambridge Theatre! 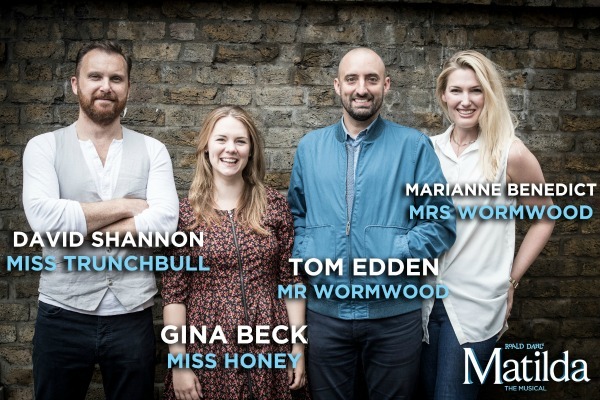 David Shannon will toe the line as Miss Trunchbull, Gina Beck will join the company as Miss Honey opposite Tom Edden and Marianne Benedict as Mr and Mrs Wormwood. 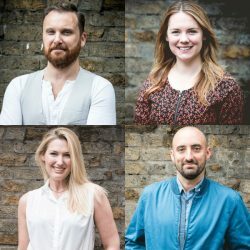 Scroll down to find out where you may have seen our new cast members before. The full adult cast includes Keisha Amponsa Banson, Richard Astbury, David Birch, Maria Graciano, Karina Hind, Peter Houston, Katie Lee, Vicki Lee Taylor, Kris Manuel, Bryan Mottram, Tom Muggeridge, Emma Robotham-Hunt, Simon Shorten, Biancha Szynal, Callum Train and Robert Tregoning. The new children’s cast will be announced in due course. Matilda The Musical is currently booking at the Cambridge Theatre until 27 May 2018. Gina Beck (Miss Honey) is renowned for leading roles in musical theatre. Previous roles have included Glinda in Wicked (Apollo Victoria Theatre & US Tour), Christine Daaé in The Phantom of the Opera (Her Majesty’s Theatre), Magnolia Hawks in Daniel Evan’s production of Show Boat (New London Theatre) and Cosette in Les Misérables (Queen’s Theatre). A graduate of the Royal Central School of Speech and Drama, her other theatre credits include Far From the Madding Crowd (The Watermill Theatre) and The Belle’s Stratagem (Southwark Playhouse) both directed by Jessica Swale, I Love You You’re Perfect Now Change (Arts Theatre Upstairs), Jacques Brel is Alive and Well and Living in Paris (Charing Cross Theatre), The Sound of Music (Kuala Lumpur), Peter Pan (Birmingham Rep), The Kissing Dance (Jermyn Street Theatre) and Imagine This (Plymouth Theatre Royal). Her television credits include the BBC’s Doctors and Sherlock Holmes and The Case of the Silk Stocking. Opera credits include Madame Butterfly and L’elisir d’amore (Opera Holland Park). She was a soloist in the 21st and 25th anniversary celebrations of Les Misérables as well as in the recent blockbuster film version. She made her BBC Proms debut in 2016 as a soloist in the BBC’s Bernstein prom. Marianne Benedict (Mrs Wormwood) has most recently appeared as Grizabella in Cats (UK Tour). Her other credits include Women On A Verge Of A Nervous Breakdown (Playhouse Theatre), The Wizard of Oz (London Palladium), Dirty Dancing (Aldwych Theatre), We Will Rock You (Dominion Theatre), Chicago (Oldham Coliseum), The Girl Dusty (Duchess Theatre), Crazy for You (Lincoln Theatre Royal and UK Tour), Return to the Forbidden Planet (Basingstoke Haymarket and UK Tour), The Blonde Bombshells of 1943 (Stoke New Vic & Oldham Coliseum), Loveshack (UK Tour), The Sunshine Boys (Oldham Coliseum), Debbie Does Dallas (Old Fire Station Theatre, Oxford) and The Country Wife (Watford Palace Theatre). Having studied at the Arts Educational School, she has also appeared in Eastenders. Tom Edden (Mr Wormwood) is known for his work across stage, television and film. His theatre work includes Amadeus (National Theatre), One Man, Two Guvnors (National Theatre, Adelphi Theatre, UK Tour & Music Box Theatre, Broadway) for which he received Tony and Critic’s Circle nominations and won The Drama Desk Award for his role as Alfie, and Oliver! (Sheffield Crucible) for which he was nominated for a UK Theatre Award for his role as Fagin. Other notable credits include The Resistible Rise of Arturo Ui (Donmar Warehouse), Doctor Faustus (Duke of York’s Theatre), Peter Pan Goes Wrong (Apollo Theatre), Les Misérables (Queen’s Theatre) and Measure for Measure (Young Vic). His film credits include Star Wars Episode VII – The Force Awakens, Mr Turner and Cinderella; television includes Upstart Crow, The Scandalous Lady W and Doctor Who. David Shannon (Miss Trunchbull) is known for playing iconic stage roles in the West End and beyond. His extensive stage credits include The Phantom in The Phantom of the Opera (Her Majesty’s Theatre), Chris in Miss Saigon (Theatre Royal, Drury Lane & UK Tour) and Jean Valjean in Les Misérables (Queen’s Theatre). Other credits include, The Beautiful Game (Cambridge Theatre), Romeo and Juliet, Threepenny Opera and Sweeney Todd (Gate Theatre, Dublin), Martin Guerre (Prince Edward Theatre), Cats (New London Theatre), Whistle Down the Wind (Aldwych Theatre), Jesus Christ Superstar (N.C.H Dublin) and Notre Dame de Paris (Dominion Theatre). Film credits include Noah, 5 to 7, Framed and La Visa Loca. David is also one half of Irish singing duo ‘Fir’, alongside Simon Morgan. He has also made regular appearances on the past three seasons of the History Channel’s Vikings.